The Mathematics Applications Consortium for Science and Industry - Ireland’s foremost applied mathematics group - hosted the 87th European Study Group (problem-solving workshop) with Industry, 24th-29th June. The Study Group was opened by Martin Hynes, Chief Executive of the European Science Foundation. 100 academics (from PhD students to full professors) from over 10 different countries attended, The participating industry partners were from several different sectors: electronics, ICT, Food and drink, manufacturing, the environment, and pharmaceutics. Photo: (from left to right) visiting researchers (Nadia Smith, Mark Curtis), MACSI Director Stephen O'Brien, and MACSI Postdocs (Davide Cellai, Vincent Cregan) working on the Rusal Aughinish granular flow project during ESGI 87. Student Mathematical Modelling Workshop 20th – 22nd June 50 undergraduate students and postgraduate researchers from across Europe spent three days in MACSI working in teams on eight real-world challenges ranging from modelling the human kidney to how to accurately weigh fruit on a conveyor belt. 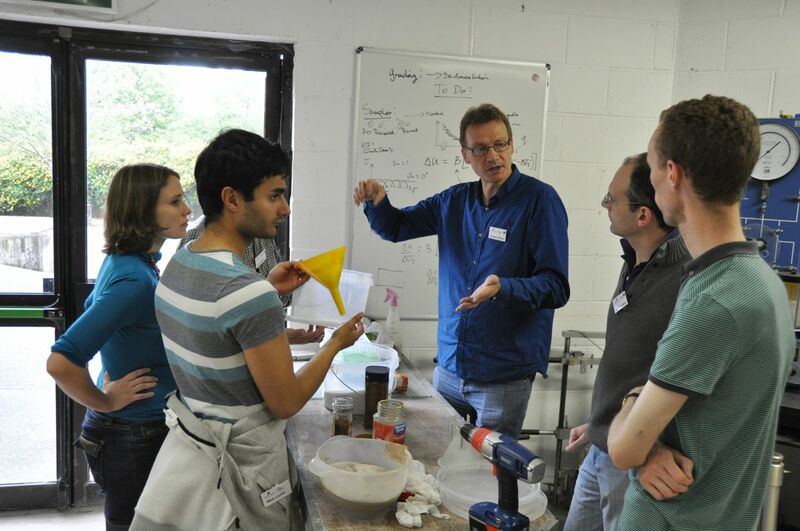 The workshop was designed to provide participants with hands-on experience of mathematical modelling, and as an introduction to problem-solving workshops with industry. Photo: Postgraduate students hard at work during the student mathematical modelling workshop. 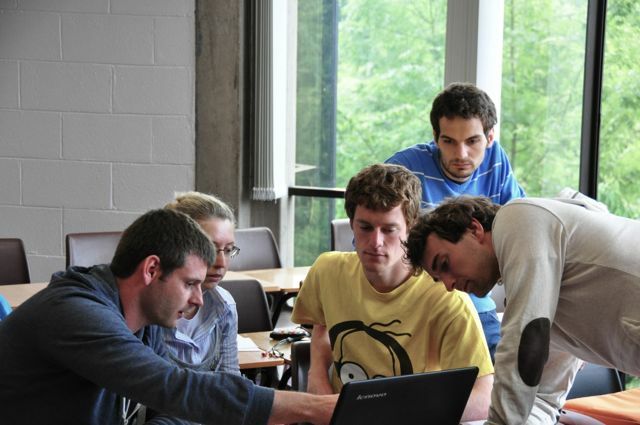 MACSI hosted the 6th residential Mathematical Modelling Summer School from 18th - 22nd June 2012. 50 secondary school students aged 16 to 18 years of age from many counties in Ireland took part. Students engaged in a number of activities during the week and were introduced to aspects of mathematics they were not familiar with. The week was a great success both for students and tutors. 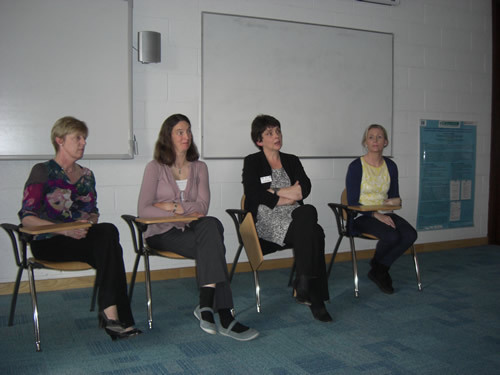 The Mathematics Applications Consortium for Science and Industry (MACSI) and the National Centre for Excellence in Mathematics and Science Teaching and Learning (NCE-MSTL), hosted the third Women in Mathematics Day in Ireland on the 24th of April. The day, sponsored by the UL Science and Engineering Faculty and Analog Devices, included presentations and posters by women active in mathematics and mathematics education teaching and research at a variety of career stages. Forty mathematicians from around Ireland attended, and the feedback from the day was extremely positive.